Since Paul is out of town for a few days and the older boys are back at their moms, Elizabeth wanted to make dinner for herself and Finn last night. All their favorite things, of course! She was pleased with her dinner-making skills, and I enjoyed watching her become a little more self-sufficient. 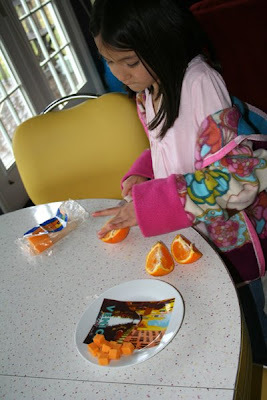 For herself, she cubed cheese, sliced oranges and added crackers. 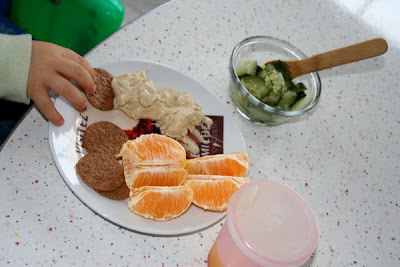 For Finn, she dished hummus, sectioned an orange, added crackers and heated left-over steamed zucchini. 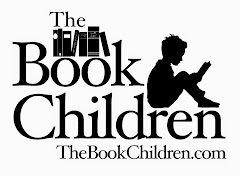 I just realized, late obviously, that St. Patrick's Day is upon us, and with Paul gone and the added logistical challenges that brings, I'd neglected to prepare any St. Paddy's Day merriment for the kids. 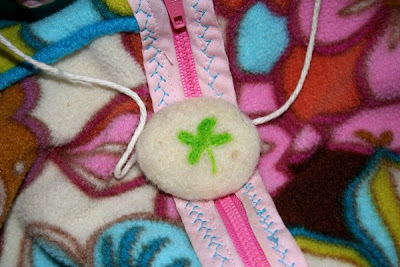 Quickly, I felted up this pendant for Elizabeth, and I'll be dragging out a few books to read with the kids tonight, as well as trying to make green bread, like they have at the bakery, only without the green food coloring. Is that even possible?! I also took up practicing my knitting again, trying to rib this time. I don't really like the edges of these sideways ribbed rows. On my needles now is a vertical ribbing that I'm trying. Someone special I know has requested a scarf so I wanted to try things out before I launched myself headlong into ribbed scarf making. 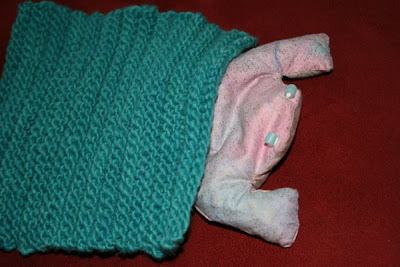 Elizabeth's frog thinks the sideways ribbing is just fine, thank you. Hey, that's some very healthy and yummy dinner Elizabeth made! Way to go, girl! 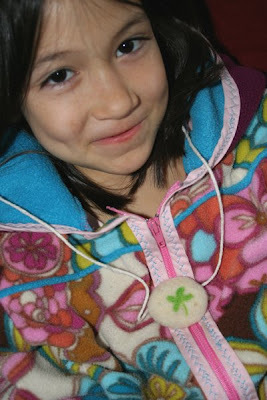 That little felted necklace you made is great. I was looking around at the last minute yesterday for some St. Patty's day activities for my kids as well. She's a very healthy girl! And that necklace is darling. What a great dinner Elizabeth made - all my favorites! Love the necklace and I think your ribbing looks great! 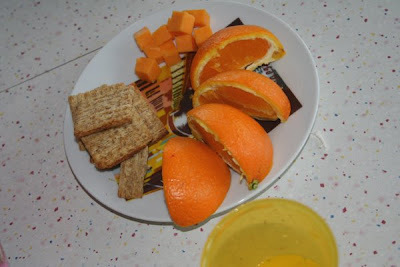 What a yummy dinner and quite healthy, too! She's welcome to make us dinner anytime! And I like your felting! Those foods are our favorite too. ;) That little pendant is the cutest!